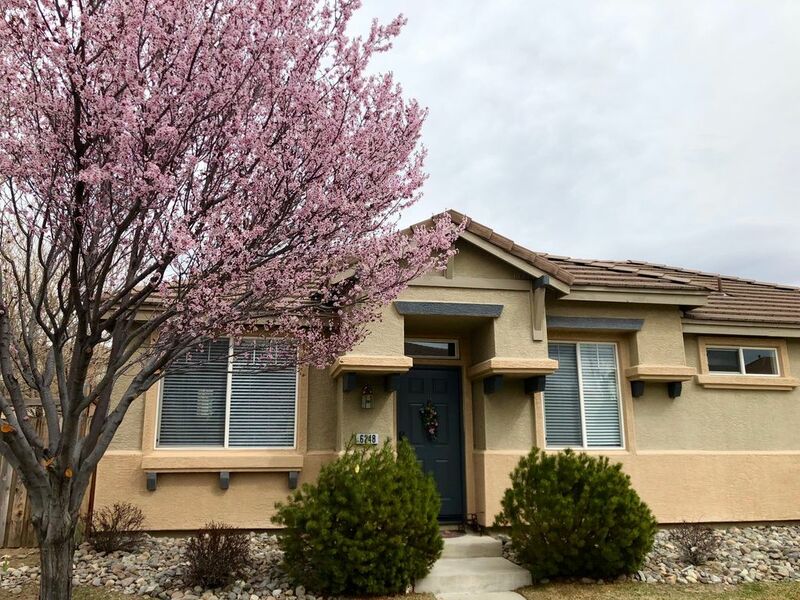 This charming 2 bedroom 2 bathroom with a den bonus room consisting of almost 1200 square feet is surrounded by fabulous golf courses with golf lake and mountain views. This is the perfect location for relaxation and local activities and close enough to downtown Reno and Sparks casinos for fun gambling, entertainment, and great meals. 24 hours a day security. Charter High speed internet with WiFi. 42 inch TV in living room with access to Netflix, Hulu, Amazon streaming and Sling TV with some Cable channels from Roku box. TV in master bedroom with Roku box. Den is a quiet room off the living room that can be used for relaxing, reading or working. It has a built in desk, and sofa sleeper that sleeps two with comfortable memory foam mattress. Laundry room with washer and dryer along with cloth washing detergent. Garage access through laundry room. Enjoy the outdoors by sitting at a table in the fenced private rear yard patio area. During the summer months the neighborhood pool and jacuzzi will be available for guests with a gym available for use year round. The gym and pool both have spectacular views overlooking the golf course and mountains. The home is located approximately a half mile from the Red Hawk Golf Resort. The Golden Eagle Regional Sports (Baseball/Softball) Field is within one mile. The surrounding Wingfield Springs neighborhood is filled with miles of walking, biking, and trails. We are five minutes away from the Pioneer Meadow Shopping Center that includes a Raley's Supermarket along with a Starbucks for those coffee lovers, and many other popular stores. This neighborhood is country quiet while city close. Approximately 7.5 miles from the Nugget Casino and 11 Miles from downtown Reno with all of its many top of the line casinos, entertainment and events. Easy access to Reno/Tahoe International Airport. For those ski lovers, we are close enough to Mount Rose and Tahoe ski areas for day trips. I am a retired elementary teacher who enjoys meeting new people. I grew up in south Louisiana and was taught early on how to make the guests in our home feel like he/she is a part of the family. I want you to feel like you are home, just in a different city. Please feel free to contact me at any time with any questions that you may have. I bought this property in Reno/Sparks because of the abundant sunshine and the many activities this city has to offer.A huge bonus is being so close to Tahoe and the beauty that surrounds this beautiful city. What made me fall in love with my home is the many windows that are near the ceiling that brings in lots of sunshine throughout the home. This place was perfect for my family and I. Regina was very quick to respond, and a pleasure to deal with. I would recommend this place to friends and family any day. Thank you Rhonda for taking care of my home. Please book anytime. This is a great place to stay. We were welcomed by Regina with a perfectly clean and inviting home and fruit and treats, including dog treats! Great size and well provisioned. Loved the gas log fireplace. Convenient to local shopping and Reno. Clean, comfortable and very very homey. Great place, very comfortable and clean. Quiet neighborhood and shopping close by. Safe area, beautiful sunsets. Thank you Eddy for your kind review and for taking care of my home. If you’re every back in Sparks I would love for you to book my property. Have a Happy Thanksgiving. I recommend Edwina to all future hosts. This home was perfect for my family's needs. The home is new and furnished beautifully. It had everything we needed for our three night stay. The owner, Regina, had even put out flowers, a welcome sign, and some Halloween goodies for my boys; we felt welcome right as we walked through the door. The home was easy to find as well. It is in a nice, quiet neighborhood but so close to shopping, a grocery store, a really good restaurants. Regina left some helpful information and she provided great food recommendations. The home was clean and we had no issues with anything in the home. All thast was required upon check out were for us to take out the garbage and clean our dishes. There is nothing I would have changed about this rental. Thank you Elsie for your positive review and for taking such good care of my home. hope to have you and your family again the next time you’re in Sparks. I highly recommend this family to other hosts.